Last week we received this lovely package from Elly. I requested to review their Red Monkey shoes as Tiger girl loves the brightly coloured shoes. I was pleasantly surprised when Audrey (one of the owners) said they will be sending one of their dresses along with the shoes for Tiger girl to try out and would be delivering the items by courrier. The shoes and lovely lady bug printed matching dress that was in the packages. Tiger girl was immediately dressed in the outfit and took around the neighbourhood to try out the shoes. It fitted her like a glove and didn’t fall off even though she was climbing up and down the stairs and was even running in it. The sole was really soft as they were made of Swedish organic leather which had been hand sewn. on stitching of the monkey face on the shoes were excellent as I could not spot any stay threads on the shoes which I have seen on other soft sole shoes which Tiger girl had before. As you can see in the picture on the right, Tiger girl can wriggle her feet easily in the shoe. The shape and design of the shoe gives her maximum comfort while wearing them. 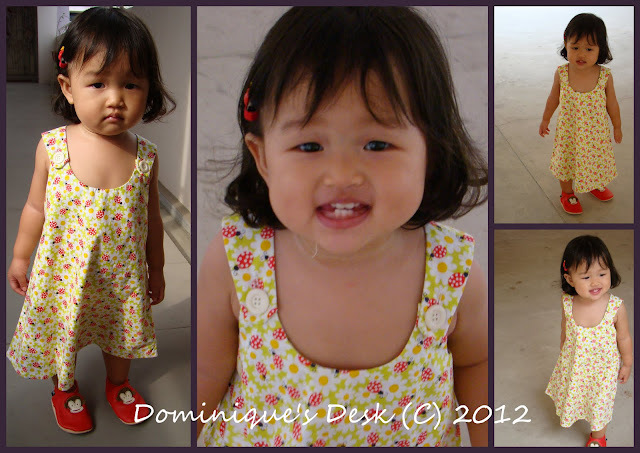 The floral ladybug dress was a bit long for her as it’s for girls age 2-3 yrs old. I requested for a 2T as most of the clothes she is wearing is about that size. I love the fabric and the cutting of the dress. The sleeves hug her shoulders and do not fall off even when she runs around. The material doesn’t crumple easily even after washing it. Disclaimer: I received a complementary pair of Bellio shoes and Elly dress for review purposes. All opinions at 100% my own.